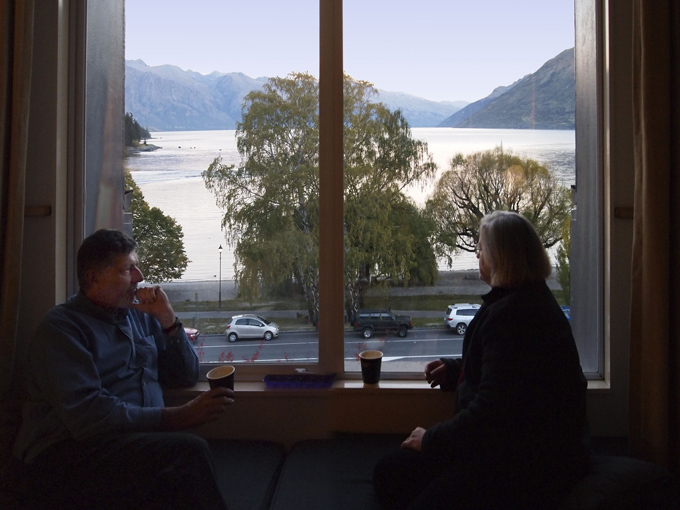 We checked into the Rydges on the Lake hotel at Queenstown in the late afternoon and the lake-view room demanded that a camera obscura image be made. Hotel and motel rooms are all pretty much the same—the beds, the bathroom, the table with one chair maybe two, the big mirror, the tiny bar fridge full of junk food and drink and the TV. In the room one could be anywhere and nowhere. That evening a visit to the local 4 Square store meant that we were equipped with enough black plastic bin liners and some black electrical tape to cover the 2.5 X 3 metre window. What we needed to complement the image potential for the picture was a beautiful clear sunny day—and that’s exactly what happened the next day. There were two sessions, one around mid-day and the other late afternoon. Blue sky, the golden leaves of poplar trees in autumn and the colours of lake and mountain filled the room. In between shoots we left the ‘Do Not Disturb’ sign on the door just in case room-cleaning staff should intervene—We often wonder about what unsuspecting visitors would think when first entering the blacked-out space of the room. 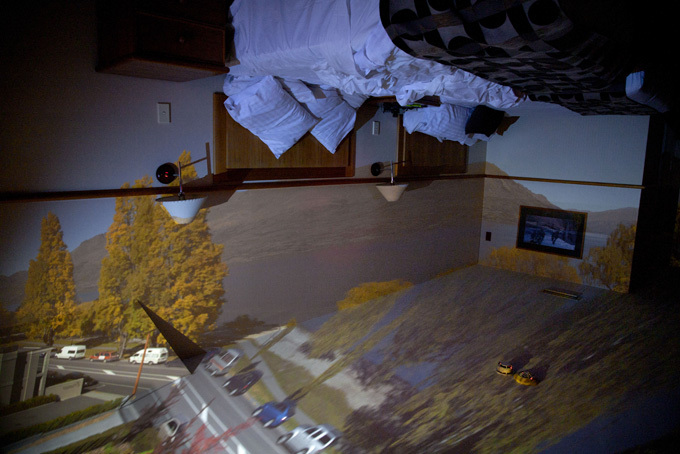 Three main images were made—one of the un-made bed, a deep shot into the room, one each of the both of us—Vicky timing the one-minute exposure, the other, a simulation of Doug checking the review screen of the Olympus camera that had been used for image-making that day. 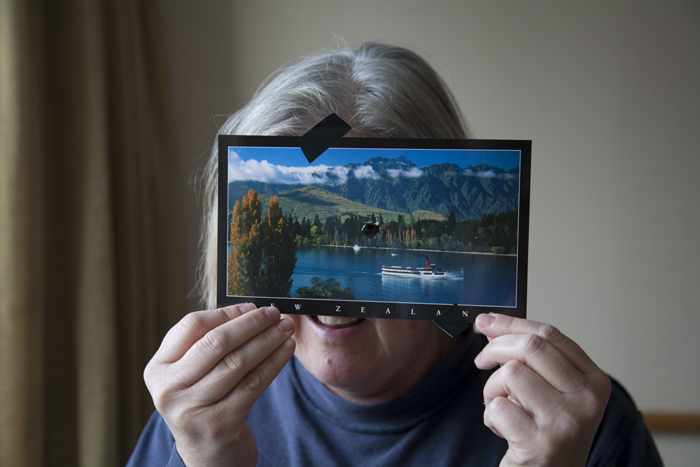 The ‘pinhole’ was fashioned from a postcard of Lake Wakatipu with the steamship the Earnslaw crossing the lake. 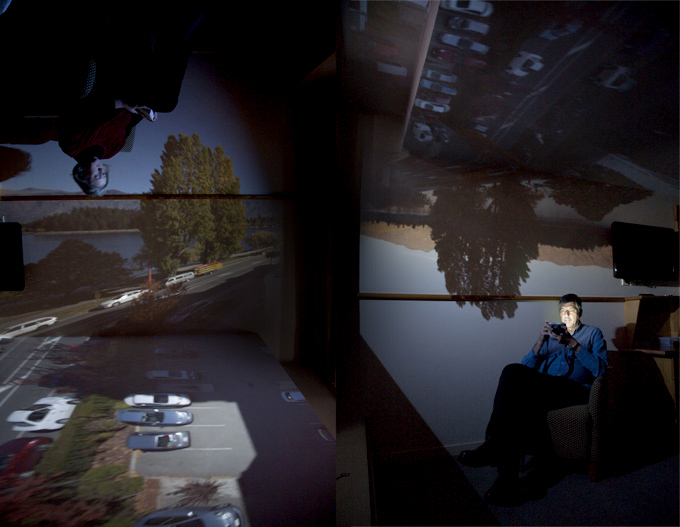 The aperture was around 10mm and the exposure time around 2.5 minutes.